We release digital modelrailway control system such as DCC and Marklin Digital. Our system is based on open hardware, e.g. Arduino. You can easily customize our system. DSair2 is a command station that remotely controls DCC and Marklin digital locomotives and turnouts using Wi-Fi from smart phones and tablets. Application installation, external Wifi router etc are unnecessary at all. DSair becomes an access point for standalone operation. There is no limit on the number of connectable smartphones. 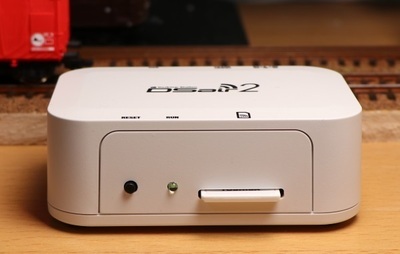 Unlike other companies, DSair2 realized DCC in a compact size, and furthermore, using FlashAir which is a Japanese-made wireless SD card, incorporating DesktopStation's original software, and using the world's only web application method at the DCC command station. Multiple smartphones can be connected to a single DSair with your friends at the party or at home. Please enjoy locomotives and accessory control in various styles while moving about wirelessly. FlashAir SD card, feeder cable and Main power supply are excluded in the package. Expert kit includes parts which need solder yourself. FlashAir, Feeder cable and Main power supply is not included. You have to configure FlashAir yourself. Please check instruction to setup FlashAir. The wiring is very easy like the follwoing! You don't need Wi-Fi router, PC and so on. DSair2 has internal Wi-Fi station. Connect directly to DSair2 via your smartphones! We provide very useful instructio video for KIT assembling. The details are descibes in DSair wiki. Main Power supply, feeder cable are not included in the package. Please order as a option. 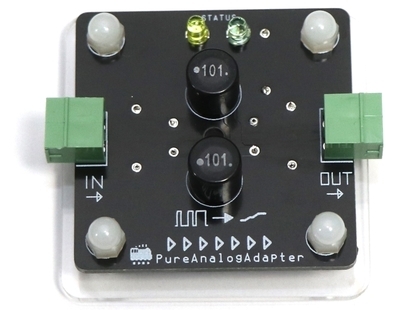 Pure Analog Adapter is a Noise cut filter specfied for DSair2 PWM analog power pack mode. This adapter inputs DC PWM pulse and also outputs filtered DC for Analog loco control. If you have locomotives equipped coreless motor, this adapter removes vibration and the other issues. Some DCC deocoder does not recognize DC PWM pulse. This adapter solves these problems. The details are descibes in wiki. 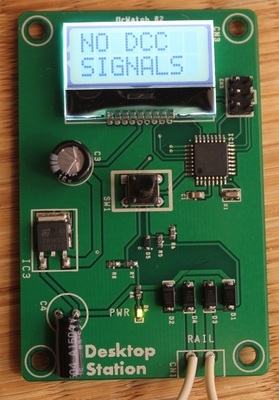 DCC Pocket Monitor DSwatch is a monitor device to display DCC signal in tracks. You can see locomotive control status and turnout's. You can easily to change the contents pressing the button. Power supply of DSwatch is proided by tracks. Not required external power supply. If you faced DCC trouble, please use DSwatch. Connect DSwatch to your track. You can see DCC packet data on the track. Mint can is a command station compatible with DCC / Marklin Motorola, also the world's smallest all-in-one command station. Desktop Station developed and sold until the middle of 2017, but currently TwayDCC provides this product. This controller is perfect for mint cans ALTOIDS board size. It is very small and inexpensive, but you can drive locomotives, turnouts, write CV. The details are descibes in Mint tin DCC controller wiki. Please prepare Main power supply, feeder cable yourself. Recommended voltage range: 12V to 18V. If you used N gauge, you will use 12V. If H0, use 12V or 15V or 16V. If you are Marklin user, use 18V. Avoid short circuit and over voltage, over temperature. This hardware has protection function but not perfect in any case. 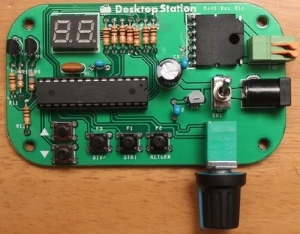 This hardware does not ensure to work all of locomotives and DCC or MM2 decoders. DC power supply with cebter plus and output connectr is 2,1x5,5mm. The voltage depends on your model railway system. See the followings. If use marklin H0, 18V powersupply and output current is required 2Amp or more. If use DCC H0, 12V to 16V power supply and output current is required 2Amp or more. If use DCC N, 12V power supply and output current is required 2Amp or more.